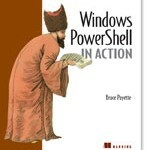 For those of you who wish to learn or read more about PowerShell I will recommend the book PowerShell in Action by Bruce Payette. Bruce Payette is one of the co-designers of the PowerShell language. The book contents great examples and is easy readability.